Old School Weight Training Strength Strongman Lifting Power Vintage Bodybuilding Barbells Dumbells: Whelan Strength Training - Now in our 20th Year! 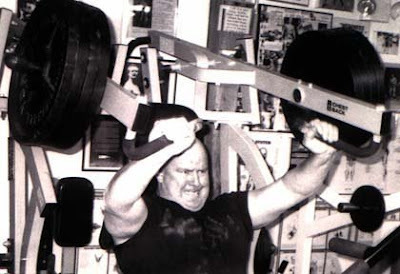 Above: Bob Whelan doing a set of 9 reps with 360 pounds on the Hammer chest press at WST. I can't believe how time flies. It seems like yesterday when I left the Federal Government to make my passion my profession in 1990. It was a scary but exciting time in my life. People thought I was crazy to leave a prestegious career with CIA and almost 14 years of Federal service. (Counting my Air Force time.) Don't get me wrong - I loved the Agency and worked with some of the highest quality people in the world, but me and God had other plans for me. I already had a graduate degree and thought I was "done" with school, but I did what I knew I had to do. In my mid thirties I took the "hard road" less travelled, I switched careers and I started graduate school (again), this time at GMU in exercise science. I wanted to be great not just survive in my new business and that meant a degree in the field, not just a phony certification like most personal trainers get. I had no more money coming in anymore from the government but I had faith and just put an ad in the paper. It was either do this or become homeless. There was no turning back. It was sink or swim. I had no equipment at first and went to peoples homes for about 2 years while going to graduate school and working part time too. It was tough but I made it. It was worth it. I'm so glad I had the guts to follow my dreams and not be a numb robot just to get a pension. I bet on ME and won! My advice: Don't follow the crowd and have the courage to take a chance on yourself. Follow your dreams and you will make your own "security". Time flies when you are having fun.